The Respect Project is an early intervention programme for 13-14 year olds. Designed to help young people in School Year 9 to increase their ability to deal with life’s problems, participants become more resilient. The Respect Project helps participants to view crisis situations in a less daunting way by re-framing adversities. Both beneficial and damaging effects of actions are recognised and the young people are taught to set reasonable and manageable goals to deal with problems. A series of challenges and coping strategies develop positive self-esteem and self-confidence. The Project takes place over a four month period, during term time. Some elements happen during school time and others are at evenings and weekends. 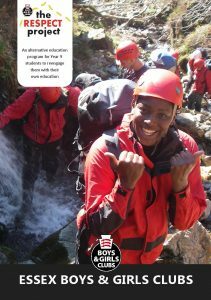 All take place away from the school setting and are delivered by fully vetted and trained youth workers. This informality allows the young people to open up to trusted adults and overcome fears and barriers to progress. Our School Partners are key to the success of the project. The school staff are best placed to identify the young people who will benefit most from the programme. The school must then release the participants for up to 7 days of term and is required to provide feedback on the participant’s progress at school. School staff are not required to attend any of the activities, however they are encouraged to attend the Presentation Evening at the end of the project. Basildon: The Basildon Academies, James Hornsby School, Woodlands School. Braintree: Alec Hunter Humanities College, Notley High School, Tabor Science College. Colchester: Alderman Blaxill School, The Gilberd School, Philip Morant School & College, St Helena School, Colchester Academy, The Thomas Lord Audley School, Thurstable School. Thurrock: The Gateway Academy, The Grays Science, Media & Arts College, William Edwards School, Gable Hall School Performing Arts College, Hassenbrook Technology College, St Clere’s Science College, Harris Academy Chafford Hundred, The Ockendon Academy, Ormiston Park Academy. Southend: Cecil Jones College, Futures Community College, Shoeburyness High School. Uttlesford: The Helena Romanes School, The Mountfitchet Maths & Computing College, Newport Free Grammar School, Saffron Walden County High School. counts as up to 6 of the credits needed to achieve Certificate of Personal Effectiveness (CoPE). offers a progression to the Award of Personal Effectiveness (AoPE) and Wider Key Skills. All of the above are worth UCAS points. Parents and guardians are asked to provide feedback about the impact of the project at home and with family and they are also invited to the Presentation Evening at the end of the project. Essex Boys and Girls Clubs aims to offer the project to schools part- or fully-funded. The fundraising process can take time and we ask schools to make a contribution wherever possible.